The San Francisco Public Utilities Commission is making some little progress groping in the dark and finding its way with a flashlight whose batteries are dying out. Susan Leal really has to have some sound idea about our Energy Requirements, Transmission Lines, Reliability Must Run and the pollution issues linked to it. She must also be able to make strides and put in place Solar Project and other clean energy projects to better serve the constituent of San Francisco. We have the Clean Water Drinking Project that is now being discussed and fine tuned. The over $4 billion project to revamp the whole Hetch Hetchy system will take some time - and when the Environmental Impact Report is in place - real imperial data will set the tone. The Capital Improvement Project is being reviewed and crooks that want a piece of the pie are weeded out. Some of them Willie L. Brown's cronies. Susan micro manages and she has personally weeded out contracts and bids that she thought dubious in nature. You go girl! The Raw Sewage Project called Clean Water Project, which is deceiving to the Public at Large is making slow progress. The rates the constituents pay were frozen for years. Naturally, SFPUC provided the service at a loss and deferred maintenance not to create any waves. Now the constituents have to fork out 33% if not more in the near future 22% in addition to the about 11% in sewage rate hikes at present. The Hetch Hetchy system as a whole with a series of major pumping stations, reservoirs, dams, lakes, open space area, aging pipes, cracks in the dams, filtering stations that need attention, treatment plants in disrepair - all demand attention. Susan Leal has no engineering expertise but she has an architect Tony Irons and a few others that purport to be quick learners. Susan will keep her fingers crossed and hope for the best. It is all about making water flow in the right direction. It is all about gravity. At the last SFPUC meeting Susan Leal proposed a major change in the organization - 6 Deputy Mangers that would put a horizontal management in place and of course all the high paying jobs would go to those that share Susan Leal's concern - keep the inner circle tight. You go girl! The Mayor did not anoint you for anything! 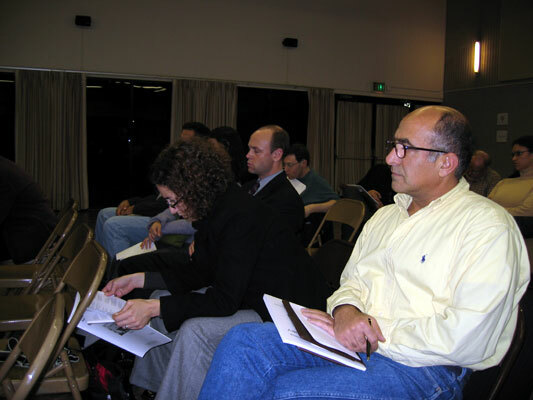 At the last SFPUC meeting January 25, 2005 in Room 400 - Dennis Normandy was replaced by Richard Sklar as President and Ann Moller Caen was voted in as Vice President. Ryan Brooks tried to be the Vice President but has to rest on his laurels for now. Can I have a recount he pleaded - reminded me of Florida. Susan will be much more comfortable with Richard Sklar who can now directly and indirectly control the bids, the contracts - the ins and outs of this large malfeasance of a system that has grown cancerous over years of deferred maintenance and utter corruption of the highest order. Of course Patricia Martel the former Director is to be blamed. She brought all her woes from Daly City and implanted them in San Francisco. In Daly City she was the Assistant City Manager - but she was quick learner and she did her homework well. Middle of June 2005 SFPUC is sponsoring a conference on Water and hopefully we all will learn about this source of life and sustenance. If there is no water most everything - fails. SFPUC sponsored a Solar Conference some time ago and this was good. Good people will be coming from all over the world and we all welcome them to San Francisco - our City needs the money. I will ask Gavin Newsom to ward off the impending Hotel Strike. Susan Leal visited the Southeast Facility Commissioners to address the only sitting Commission in the City and County of San Francisco. The Commission was initially formed to address the expansion of the Phelps Raw Sewage Treatment Plant. The community got a lot of pollution and added pollution and woes as the over tasked plant continues to receive 80% of the City raw sewage and a 100% from Colma, Brisbane, Daly City, and Burlingame. No one really wants to talk about the adverse impacts of the Phelps Raw Sewage Treatment Plant or the aging infrastructure. They do talk ad nauseam as I said - the tongue having no bone so you can wag it all you want. Never mind what they say they love to talk and talk. Pacific Gas and Electric is busy trying to have its Jeferson-Martin Transmission Line in place by 2007. Hopefully the transmission line between Mirant and Hunters Point all underground and with checks and balance will be in place and running by 2009. In 2010 we can safely close down the two power plants and get rid of all the toxins produced by fossil fuel all these years. Several smaller underground upgraded transmission lines will also be in place. Work is in progress with PG&E calling the shots. The City barks but PG&E has the bucks. We do not want any of the proposed Combustible Turbines in our neighborhoods. The SFPUC can place them near the Zoo or at the Presidio of San Francisco to cater to the needs of George Lucas and his Letterman Digital Center. One can be placed in the Mid-Market area by SFPUC closer to 1145 Market. There are training opportunities for the community - but really the details have to be worked with the union and the rednecks who control the sanitary engineering positions and field. Heard about the hangman's noose and the various incidents all over SFPUC plants. Well this is San Francisco and not much as changed in certain quarters. Promises were made to outreach and make some little concession to the constituents of zip code 94124. Time will tell. The present person that took the outreach position for some apparent reason went to the various homeless shelters to recruit sanitary engineers. One would have thought to find out better sources - but what can I say. A trip to the moon may be? Some loud mouth constituents tried to divert the Director of SFPUC from addressing the real issues. That is nothing unusual. Anyone getting $10,000 from Lennar to provoke and disrupt meetings and has been doing this for years - is nothing unusual. The man spoke about being in the Armed Force - I wonder what was his MOS. Some times I wonder at the pathetic Negroes who sell out their community and bring shame to the community at large. Espanola Jackson as usual asked the right questions and showed concern for the community. Millard Larkin II spoke about his impending resignation from the Commission - he just served his term as President. John Nauer asked some pertinent questions about job opportunities. Promises were made and I think they may be kept this time around. Tony Winniker was in the audience and Susan Leal just found out that Sam Murray's mother died. Both Sam and his mother went to hospital - Sam had a bout of phenomena and his mother illness from old age. Sam is recovering and we send our condolences to Sam Murray on the death of his loving mother. Susan Leal assured that she and SFPUC would pay their respects. Flowers are in order and who says we do not care? One gentleman asked for statistics he wanted to know about how much money was generated from Sewer Services - he will get the report so that he can review it. The Community Based Organizations such as Young Community Developers who have wasted millions in training before - need one more chance to build homes on a toxic dump that is Parcel A at Hunters Point. 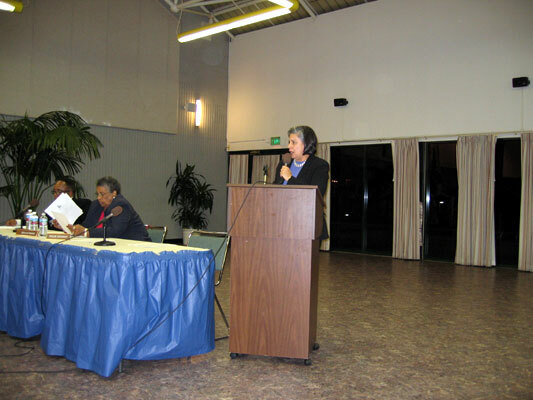 But more they need long term jobs on all the SFPUC projects - Susan Leal promised she would attend to them. That I thought was very pretty and lollipop like. The sitting Southeast Commissioners had nothing much to say - I guess they were overwhelmed with the project and could not comprehend the details. The Commission does not reflect the diverse community but really that is not for me to say. Willie L. Brown and his cronies have one last quadrant left in the Southeast Sector - they will build the African Market on Parcel A while we really do not have a nice market on 3rd Street. They will build homes in the middle of Chernobyl while most others - will leave town. The homes will have one assurance - by gravity all their waste will miraculously land in the Bayview and from there into the Bay - most of it half-treated. I spoke about our infants dying and false promises. I made a statement that Pacific Gas and Electric controls the transmission lines and they will rule the roast. I spoke about sellouts and some were in the audience. I tried in vain to say something that would make them think. I remember well I did say that the guest including Susan Leal were welcome to the Southeast Facility.